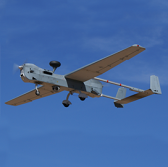 Stryke Industries has received a contract to integrate an artificial intelligence engine with U.S. Army unmanned aerial systems and a universal ground control station. Stryke will conduct the ScenGen engine integration effort in partnership with subcontractor Scorpion Computer Services as part of the Defense Research and Development Rapid Innovation Fund program, Scorpion said Thursday. The Army Contracting Command at Redstone Arsenal in Alabama will license the Scorpion-made technology from Stryke. UGCS is designed to facilitate interoperability between the service branch’s multiple unmanned platforms via a single control facility. The station is equipped with flight-critical modular tools that work to help operators manage drones such as the MQ-1C Gray Eagle, MQ-5B Hunter and the RQ-7B Shadow. Los Angeles-based Scorpion, led by computer security professional Walter O’Brien, offers consulting and product development services to the military and civilian sectors. Warsaw, Indiana-based Stryke partners with entrepreneurs, innovators and companies in efforts to help government customers implement disruptive technology.